How to apply: "Spider veins can be covered with your regular foundation followed by a pencil concealer dabbed directly onto the broken capillaries and blended with your ring finger," says Dedivanovic. 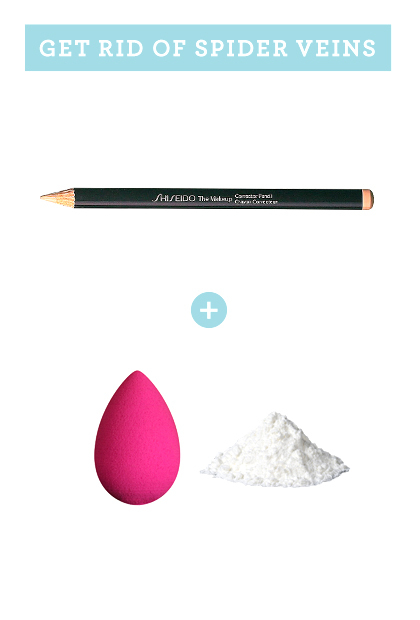 Try Shiseido The Makeup Corrector Pencil, $18. Then he says, "I like to then go over it again with a light layer of foundation just to really blend the products into the skin and ensure that the skin tone is even." Finish with a damp sponge dipped into loose powder. Try Shiseido The Makeup Translucent Loose Powder, $35.